Detail: hearth, fireplace, dripping pan, gridiron, meat, cooking pot, cleaver, salamander, key, lantern, plates, stool, spoon, pitcher, child, dog. Interesting that they show an almost pastel blue hat on the person drinking from the mug/pitcher. And what about that wooden pitcher down in the lefthand corner with possibly brash straps? Is that shown in other painting from the mid-1600? I haven’t noticed that pitcher design used by other painters, but I haven’t been looking for it. 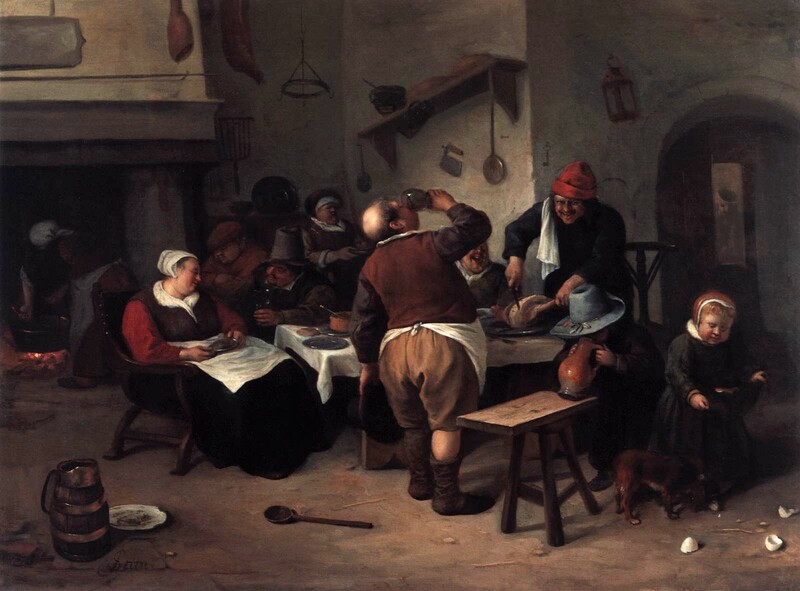 Jan Steen does paint it into several of his other paintings. I recognize the Hash knife in the wall under the shelf My grand mother had one like it. Is that item in the upper left corner a skillet?